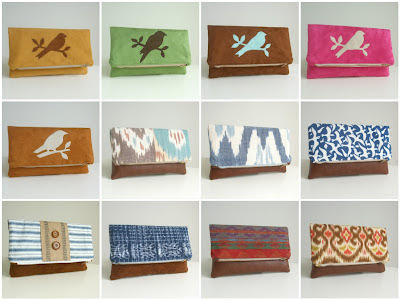 Just added a batch of Foldover Clutches to the Pesky Cat Designs shop. There's a medley to select from that includes faux suede with bird appliques, hand-woven Ikats imported from India and Guatemala, designer prints by Iman, stripes and a navajo southwestern design. 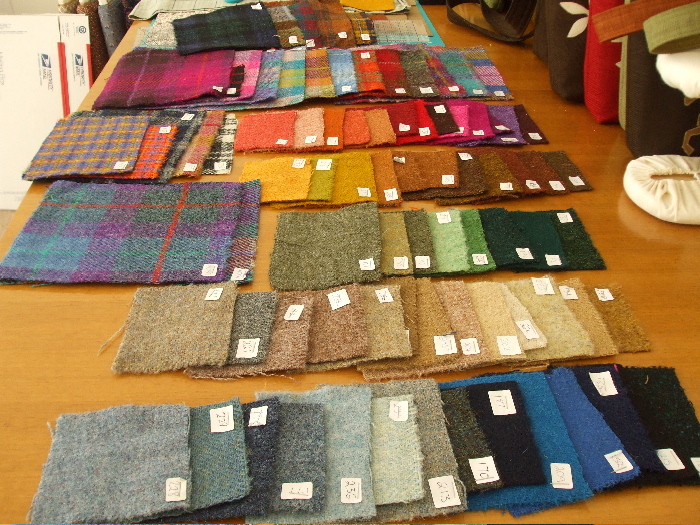 Above is a pic of my Harris Tweed sample collection. It's great to have the actual tweed to feel and see before purchasing. I still have a nice selection of tweed in my stash and plan on experimenting today with some ideas that I have for the Fall Collection. I realize summer has only begun here but there are only a few months to work out ideas before autumn arrives! Elisa, you are wonderfully productive! Beautiful clutches!